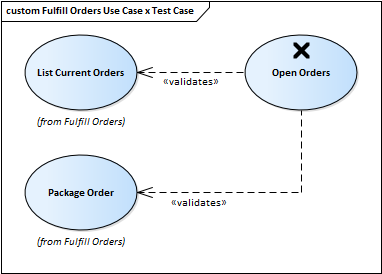 The definition of Test Cases acts as a double check on the quality of Requirements as test designer bring their own unique and often orthogonal view of the requirements. Best practice suggests that the testing team should be independent and isolated from the requirements team thus providing a fresh set of eyes on the Requirements. It is quite common for one Test Case to test a number of requirements or for a Requirement to be tested by one or more Test Cases. 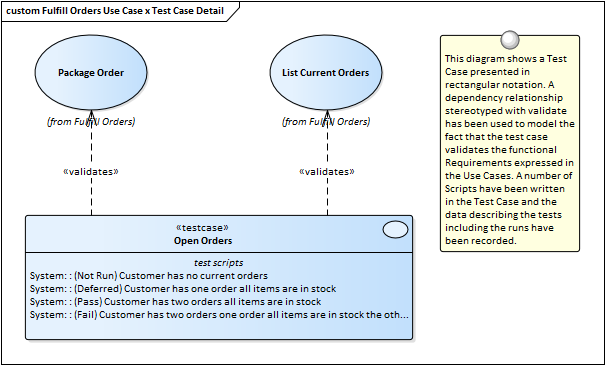 These relationships can be modeled in Enterprise Architect using the Test Case element which can have detailed test scripts defined. Any element in Enterprise Architect can have tests defined and these can be one of a number of types such as Load, Regression or Standard and can be defined as a class of test such as User Acceptance, System, Unit etc. The details of the tests including when they were run and the status of the test indicating whether it passed or failed can be recorded.